Ox is one of those restaurants that’s been spoken of as a top-10 Portland restaurant as long as it’s been open. The concept is meat-centric–literally, with the Argentine grill on display in the restaurant. Luckily, the wood-fired grill doesn’t create heavy meat smells, and there are enough vegetarian options on the “from the garden” portion of the menu to keep any herbivore happy. If you don’t want mushrooms that were fired with all those meats, there are plenty of salads and sides available. At a recent dinner, the server was very accommodating, swapping out an anchovy vinaigrette for a dijon. Many sides can be served without cheese, meat, or seafood elements. A recent spring dish was grilled cauliflower, tahini-feta purée, fried lemon, arugula, and Mama Lil’s Pickled Peppers, $9/17. Yep, you can choose a large or small portion, depending on whether you’re sharing. Bread with chimichurri is free, and refilled liberally, when your party orders something “from the grill.” That means meat for the most part at Ox, but there are also mushrooms and veggies on that portion of the menu. Reservations available for large parties, or wait at Whey Bar next door. Because there’s going to be a wait. You can put your name on the waitlist starting at 4pm daily. Dinner starts at 5. We hear it’s gluten-free friendly! 2225 NE Martin Luther King Jr. This entry was posted in Portland Restaurants and tagged ox. To be honest, I haven’t been to Ya Hala for years. The last few times we tried to walk in for dinner, probably at 6:30 on a Friday night or something, the wait has been too long. On this hopping strip on Montavilla, that’s par for the course. There’s a reason why they stay popular, with a wide variety of tasty Lebanese items for lunch, dinner, or weekend brunch. Weekend brunch is supposed to be fantastic here, from what I hear. And you can see on the menu that it speaks to a more American palate, while keeping its Lebanese flair. On the sweet side, there’s sfoof, a turmeric and anise coffee cake with cardamom icing ($5). On the savory, vegetarians have plenty of options, with a traditional Lebanese breakfast plate, shakshuka, or fried halloumi with rainbow carrots. Vegetarian, vegan, and gluten-free items are noted on the menu. Vegans have a wider range of options at lunch and dinner than at brunch. At dinner, check out vegan savory pies, kibbeh, fried veggies, and mezza. This entry was posted in Portland Restaurants and tagged lebanese, Montavilla, ya hala. Wolf and Bear’s has a special place in my heart. Their first cart was a short walk from my house, in a gravel lot that’s now–you guessed it–glass-fronted apartments or condos. Luckily, that’s not the end of the story. That little cart has turned into a TINY CART EMPIRE of three locations turning out falafel sandwiches with caramelized onion and eggplant, which I think we can agree the world needs a little more of. In addition to falafel sandwiches, Wolf and Bear’s offers sabich, an Iraqi-Jewish traditional breakfast featuring hummus, amba (mango pickle purée), sliced hard boiled egg, grilled eggplant, diced onion, cucumber & pickles, freshly cracked pepper, parsley and salad greens topped with tahini sauce & olive oil on a warm pita, $7.50. Why have I never gotten this? BRB, examining my life choices. Specify vegan if needed. Salads are available if you’re gluten-free, including the Gomasio: Home made gomasio (toasted sesame, sea salt and nori), red peppers, red onions, shredded beet and carrot, raisins on mesclun greens with house tahini sauce. $6.50. Oh, I’d eat the heck out of that. Ask for vegan if you don’t want yogurt, etc. This entry was posted in Portland Restaurants and tagged falafel, wold and bear's. The Whole Bowl serves up simple rice and bean bowls. Yep, beans and rice, with some tasty toppings. Your choices?Large or small. Each bowl has brown rice, beans, avocado, salsa, black olives, sour cream, cheddar cheese, cilantro, and “Tali Sauce.” Some people looooove the Tali Sauce, hence the popularity. Me? I can take it or leave it. But they’re perfectly good bowls! My husband gets them a lot when he’s working downtown. Naturally, the bowls can be tailored to your taste–leave off the cilantro if you want, or veganize. All bowls are wheat-free. This entry was posted in Portland Restaurants. Who likes fake meat? *dum dum dum dum dum dum dum* We like fake meat! Van Hanh isn’t your “Portland vegan” typical vegan restaurant. 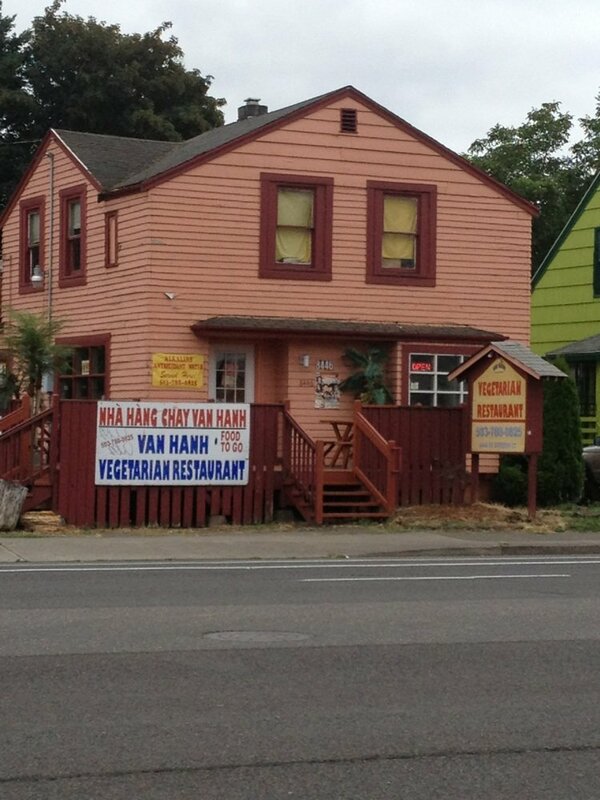 Nope, it’s a Vietnamese non-profit restaurant run by friendly nuns. Most of the menu is made of meat analogues. If that’s your thing, you’ll be in heaven. If not, you’ll still probably find plenty to eat. Just relax, be polite, and enjoy your lemongrass “chicken” made and served by Buddhist nuns and volunteers. Allow a little extra time — the service isn’t known for being fast. If you don’t speak Vietnamese, you might expect a little confusion with your order as well. I’ve never been there, but now it’s on my list. This entry was posted in Portland Restaurants and tagged van hanh. Toro Bravo is often mentioned as one of the best restaurants in Portland, and it’s up there. Tons of small plates to order, but not many entrees. That’s okay – this is a small plates kind of place. You will leave happy and stuffed. Just give me the radicchio salad (with green olive toast) and olive oil cake. But you can’t leave without potatoes bravas. And seared cauliflower might be nice. Bring some friends so you don’t have to be removed by stretcher. On my last visit, the server took out her pen and marked all the vegetarian options on the menu. Isn’t that nice? There will be a wait for your table, but they’ll take your phone number. Get a classic cocktail at The Secret Society just upstairs. It’s often said that the easiest way to get in is to show up right when they open at 5. Inquire ahead of time for vegan and gluten-free options, as menus change often. This entry was posted in Portland Restaurants and tagged spanish, Toro Bravo. The Tin Shed is one of those Portland breakfast institutions. Brunch is served until 3pm. Then they serve lunch and dinner, but I’ve never heard of anyone going there after breakfast ends. I mean, I’m sure they do it! But brunch is the main event. Of course, you can expect to wait for it. At least you can have a cup of coffee while you wait. Go ahead and grab one from the self-serve station after you check in. For many breakfast items, they promise: “We are happy to substitute ingredients to make your dish vegan and/or gluten-free. Tofu, egg whites and gluten-free toast subject to an additional charge.” Well, that’s mostly good news! Bring your pup — dogs are welcome outside. There’s even a doggie menu if a treat just doesn’t suffice, and Tuesday night is Doggie Love Night, where dogs eat free with purchase of a person’s meal. If you pine for your own pupster, sit outside so you can enjoy the dog-watching. Oh, and kids? They’re welcome, too, with a good-looking kids’ menu. Breakfast items are even customizable: Get a scrambled egg and wheat toast for $3, and add veggie sausage for $3 more. This entry was posted in Portland Restaurants and tagged tin shed. Sweetpea Baking Company is a dedicated vegan bakery in the heart of the vegan mini-mall, right next to Food Fight! I KNOW. If you’re vegan and you live in Portland and you haven’t gotten around to going here yet… I’m confused about your choices, but I’m not judging. In addition to your pastries, they offer bagels, breakfast, and a light lunch. I’ve been known to stop in for a bagel with garlicky hummus. I’m not vegan, but I have never been disappointed by a pastry here. I’d take their berry muffins over any commercial muffin easily. Fresh vegan doughnuts come out of the fryer at 9am on Saturdays. You’ll find some wheat-free items in the case, including some gigantic cookies, but no cakes or cupcakes anymore. This entry was posted in Portland Restaurants and tagged sweetpea baking. The Sweet Hereafter on Belmont is the sister bar to the Bye and Bye on Alberta. All vegan. Hip. Gluten-free friendly. Menu items include bowls, Jamaican Bowl (jerk marinated tofu, coconut kale, black beans and brown rice, $9, add avocado OR pineapple for $1), or sandwiches like the Buffalo Sub (Buffalo marinated soy curls, miso-chive cheese, lettuce, tomato and ranch. With chips and salsa. $9). All sandwiches are available as salads for the gluten-free. Like Bye and Bye, Sweet Hereafter is known for their cocktails in addition to hearty and tasty vegan food. In summer, try the signature drink: vodka, bourbon, lemon and iced tea, Served in a 32oz mason jar, $8. Oh, and bring your ID. They’re strict. Minors are allowed until 8pm, though. On nice days, sit out back in the open area. That is, if you can get a seat. They do fill up fast in prime hours. On not-so-nice days, you can… still sit out there, because it’s covered and enclosed. NICE. Happy hour is 4-7pm, with a buck off of most food and drink. NICE. This entry was posted in Portland Restaurants and tagged Patio, sweet hereafter, vegan. St. Jack is an adorable French restaurant. They used to have an adorable patisserie attached at their old location, but alas, times change. It broke my little francophile heart, is all. Other than soups, salads, and cheese, that’s about all you’re going to find in the vegetarian realm for dinner. But, who could go wrong with a cocktail and some pomme frites to start off a date night? If you miss the patisserie as much as I do, take heart: They still do madeleines baked to order at dessert. Vegans and gluten-free eaters will very likely be relegated to the salad section. Check ahead. This entry was posted in Portland Restaurants and tagged french, st. jack.